We even have a club icon and slogan! The D stands for Dangerous! Double Agents – The club members of the DDFC. Agent Ranks – How the club member ranks work for DDFC. 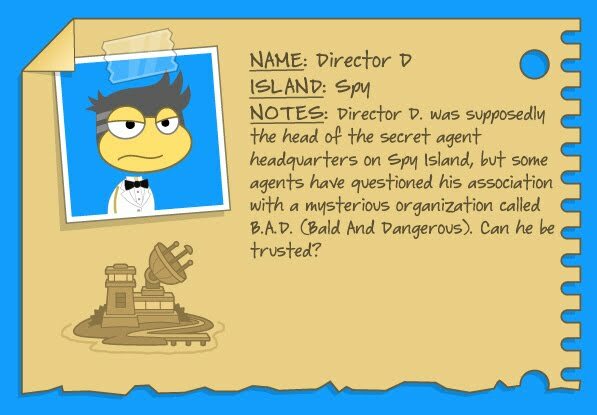 Hidden Messages In Pictures – Official Poptropica artwork that relates to Director D.
Spy Safety – Facts, trivia, an outfit description, and general info about Director D.
Here are all the club members of DDFC! They are listed in rank, then alphabetically. Here is how all the DDFC ranks work (what they do) and how many people each rank can have. They are listed by how high the rank is. Vice President – Show contribution to the DDFC, beat Spy Island at least once (The more the better), and do not ask for the rank. The President picks a certain person. Secret Agent Commander – Complete Spy Island 5 times and say anything that will possibly help you win the rank. The President will decide if you qualify. Secret Agent – Complete Spy Island 4 times and say anything that will possibly help you win the rank. The President will decide if you qualify. Spy – Complete Spy Island 3 times and say anything that will possibly help you win the rank. The President will decide if you qualify. 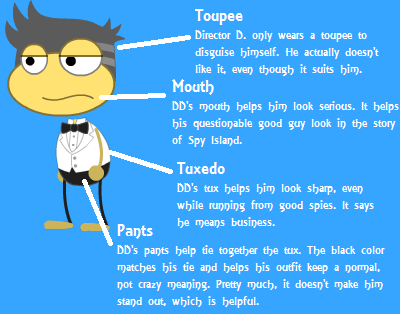 Here is all the official Poptropica artwork that relates to Director D. This doesn’t include fan art or actual hidden spy messages disguised as pictures. Everything is listed alphabetically. Director D. is the main villain on Spy Island. He is also a Poptropica Creator, but doesn’t post on the Creators’ Blog anymore. His real name is James Lema, he is the Director (Lol, Director!) 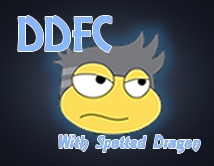 of Product Development with Poptropica, and his username is DirectorDcreator1. Director D. is the main villain on Spy Island, but reappears as a contestant on Reality TV Island. Director D. is one of the few villains that didn’t appear on Super Villain Island. Director D. is the 1st villain to pose as a good guy in the beginning of an island. Black Widow is 2nd. Director D. wears a toupee throughout the beginning and middle of Spy Island, only to reveal that he is bald at the end. B.A.D. (Bald and Dangerous) is the association of bad guys that Director D. is a part of. Director D/The Director/DD, like all other villains, has a unique outfit that shows his personality. I want… to exist. That is all. IDK. It made sense in my head, i’m sorry! May i join? I was thinking that was what you meant, but I wasn’t sure. :p I’ll add you right now! Can I be a secret Agent commander? I’ve completed spy island 5 times but in different accounts. P.s. Spy Island is my favourite island. 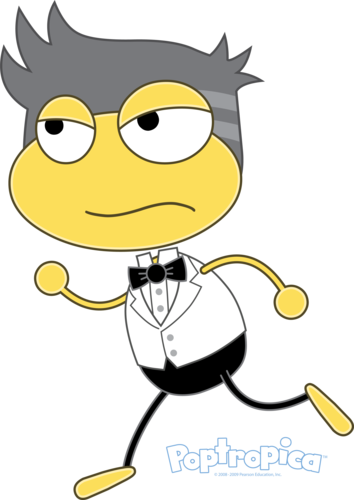 After I finish playing spy island I always pretend to be a spy in poptropica. Please allow me to be a Secret agent commander. Thanks! Do you go by Blue Hawk or Magic Monster? Okay, I just added you! Sure, I’ll ask the person that runs the page! Hi! I LOVE Director D.! The first time I played it I was like Wha-wha-what! DD is a bad guy? That’s totally awesome! I’ve completed Spy Island twice on my Trusty Biker account, but AT LEAST five times overall…. I really want to be a Secret Agent! Please allow me to be a Secret Agent! Sure! You have been added. DD is my second favorite male villain after Zeus and my fourth favorite villain after GG, Zeus, and BW. Between all of my accounts, I have completed Spy about 4 or 5 times. I like how DD goes to extreme measures to get you to trust him. I’d like to join, please. oh yeah my poptropican name is gentle speck and yaahzee12 is just user name can you answer my question? I’ll get back to you on that soon! Sorry, I’m not at home right now. Can I be a spy? I did on different accounts. I’m sorry, but can you beat it 3 times on your xplus1 account please? There’s a multiverse!The code is DAV55.I’m wearing a director d costume(Not my main account). Actually, I might have time to complete Spy island one more time today. If I do, then can I become the Secret Agent Commander? Then the Binary Bard fan club and the Director D fan club will have excellent relations! Hmmm… yeah, you can. 🙂 However I’m not in the Binary Bard Fan Club, sorry. 😦 I like BB, but he isn’t in my top 4 and the maximum clubs you can be in is 4.